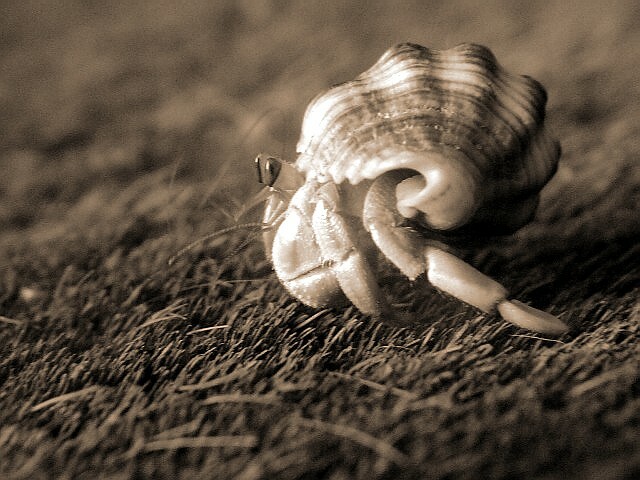 Laughing babies meet hermit crabs in two haiku by Stella Pierides in today’s feature of the International Women’s Haiku Festival. This senryu captures a moment of the happy chaos babies bring with them everywhere. The baby is probably laughing because he or she feels secure and happy in the presence of a familiar care taker. But what about this whimsical possibility: The baby laughs along with us at the humorous image of the parent “juggling” pen and feeding spoon? In any event, this laughing baby, like all laughing babies, gets the last laugh – from us. Confined to its shell, the hermit crab rarely, if ever, leaves its home. What if the woman in this haiku could leave her shell and leave behind her domestic chores? Would the “other lives” of which she dreams live up to her fantasies and justify sacrificing the security of her status quo? Maybe what the woman really wishes for is simply to know she has the freedom to choose a different path and define herself anew. Stella Pierides was born in Athens, Greece and now divides her time between Neusäss, Germany, and London, England. She is the author of Of This World (Red Moon Press, 2017); In the Garden of Absence (Fruit Dove Press, 2012), for which she received a Haiku Society of America Merit Book Award; and Feeding the Doves (Fruit Dove Press, 2013), among others. Stella serves on The Haiku Foundation board of directors and project manages the Per Diem: Daily Haiku feature for the Foundation. She enjoys reading, gardening, film, music, food, and working long hours. Find more information about the International Women’s Haiku Festival and submit your work at this link. Thank you for sharing, great writing. I read your poems, they are wonderful.